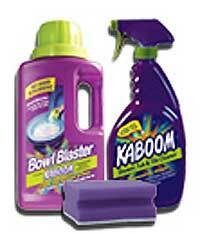 Kaboom Shower, Tub and Tile Cleaner breaks through soap scum and hard water buildup without releasing toxic fumes that will hurt your nose, eyes or skin. This high-performance formula leaves no residue after rinsing. You will love the power and effectiveness that is easy on you and tough on bathroom stains.